Anyone in Muscat who has struggled with their internet connection might find things improve soon. Late last year, funding was approved for an ambitious project to give more than 400,000 homes and premises in the Omani capital access to fibre optic broadband. Thousands of miles of cable will be laid by the end of 2021, with 80 per cent of the city to become “fibre ready” in the first phase of a national rollout. The project's significance goes beyond providing residents with the chance to enjoy Netflix or YouTube uninterrupted; the hope is that fibre optic broadband will make Oman attractive for logistics or manufacturing operations. This should promote economic diversification, an important goal in a country where hydrocarbons provide almost three-quarters of government revenue. 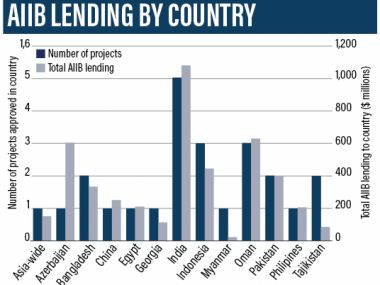 Funding is coming from the Asian Infrastructure Investment Bank (AIIB), a Chinese-initiated organisation of which the UAE was a founding member. The Articles of Agreement, the legal framework of the bank, were signed on June 29, 2015 by 50 of the named 57 prospective founding members in Beijing, while the other seven signed later. The UAE has contributed $1.18 billion (Dh4.3bn), according to national news agency WAM. 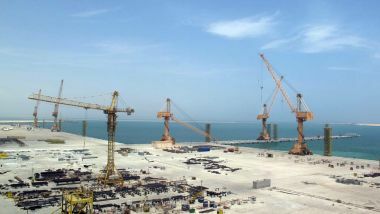 Since its 2016 official launch, the AIIB has agreed to back 28 projects, another of which involves improving port infrastructure in a special economic zone in Oman. The need for such funding is well acknowledged: estimates suggest Asia will require more than $20 trillion in infrastructure spending over the next two decades or so, and existing lenders cannot get near to supplying all the funds necessary for risky projects that the private sector or national governments balk at supporting. But for all the acknowledged demand for such finance, the AIIB's creation has not been without controversy. The organisation was seen, especially early in its genesis, as China's answer to the dominant western-led financial institutions, Beijing's attempt to challenge the "|Washington Consensus". These are the principles of free-trade and development promoted by the International Monetary Fund (IMF) and the World Bank since they were founded at the end of the Second World War. Concerns were raised that the AIIB would fund projects without conditions linked to environmental protection, human rights, labour rights and the like, which finance from the established organisations – of which the Japanese-led Asian Development Bank is another example – often comes with. China could, it was feared, use the AIIB to hand funds to allies and to advance its strategic interests by supporting projects with potential dual civilian and military applications. “The AIIB might make its loans based on the 'Beijing Consensus', a competing ideological view with the Washington Consensus … Moreover, the AIIB may represent the first step in China displacing the United States as the final arbiter of the rules of international trade,” wrote Professor Daniel Chow, a business law specialist at the Ohio State University, in early 2016. Beijing's decision to set up the AIIB is widely thought to result from the lack of reforms in organisations such as the IMF that would have given China, now the world's second-largest economy, and other developing nations more of a say in its running. Despite the support of more than 150 countries and the then US president Barack Obama, reforms fell by the wayside because approval was not forthcoming from the US Congress. 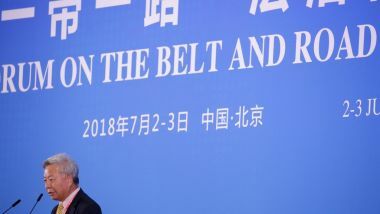 When Beijing reacted by conceiving the AIIB, Washington – worried that the new organisation would erode its global economic influence – urged allies to not to join. It was a plea that many did not heed, including the several Arabian Gulf states that had signed up in 2015. The March 2015 announcement that one of the US' closest allies, the UK, was joining was seen as key to the decision of many others to sign up. The UAE was among the nations to follow hot on the heels of London's decision. The Abu Dhabi Fund for Development was nominated to represent the UAE on the AIIB board. When it comes to the US-allied Gulf states joining, which included Kuwait and Saudi Arabia among others, David Roberts, a specialist in the defence and politics of the Gulf region at King's College London, said the question to ask was, “Why wouldn't they?” He indicated that they have to consider the views of not just Washington, but of other major powers, too. “There's a notion of balance in there … It strikes me as a fairly sensible thing they should invest in,” said Mr Roberts. Other major US allies such as France, Germany and South Korea also signed up, bringing the number to 57 by the time the AIIB launched in January 2016 with $100bn of funds, nearly 30 per cent from China. The tally of countries that are members or approved for membership recently reached 87 when Lebanon signed up. Now, almost five years since the Chinese president Xi Jinping announced plans to create the AIIB, the organisation has, said Professor Steve Tsang, director of the China Institute at the University of London's School of Oriental and African Studies (SOAS), largely confounded concerns over how it would operate. Part of the reason for this could be that the AIIB has a diverse membership and management: the president, Jin Liqun, is Chinese, but the vice presidents are British, French, German, Indian and Indonesian. “It's a development bank. It's helping the other countries to build their infrastructure and developments that they cannot afford, with good due diligence being conducted,” said Prof Tsang. 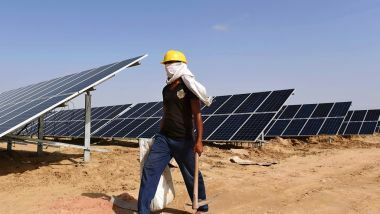 Observers have noted that schemes it has supported have typically involved standard development work, and more than one third have the World Bank as the lead investor. The largest number of projects to receive funding are in India, which analysts have pointed out is democratic and a strategic rival of China. Other recipients as well as Oman include Indonesia (an irrigation project), Philippines (flood management), Egypt (solar power), Tajikistan (hydroelectric power), Myanmar (a gas-fired power plant) and two Nato allies, Georgia (a bypass road) and Turkey (gas storage). China itself has been awarded funds to alleviate Beijing's severe air pollution by providing villages near the city with gas connections to reduce coal burning. The total amount of funds allocated so far has fallen short of initial targets, totalling less than $4.5bn over the first two years, compared to initial forecasts of $10bn plus annually. Prof Tsang suggested this could be because the organisation was carrying out careful due diligence. The rate at which projects are being given the green light appears to be accelerating, and the bank has just agreed a new model for approvals that is designed to improve efficiency while holding senior officials accountable. In being a Chinese-initiated organisation that has adopted an approach largely consistent with that of institutions led by the West or its allies, the AIIB is, said Prof Tsang, “exceptional”. “Find me another example where the Chinese created an organisation that is completely following international best practice,” he said.